When I’m bored or want to just pass my time I usually think of reading a novel or listening to music or play games rather than painting or sketching which I love so much. But for how many days I can do the same things repeatedly, so I was thinking of doing something else which can engage myself in that at least for a few days continuously . Suddenly a thought flashed in my mind, that’s nothing but decorating my room. Then again my mind started to think from where shall I start and how? Then when I just turned around and around in my room thinking what shall I do? At some point my eyes caught my plain white door, w w!! immediately I felt as if my door is asking me “Why can’t I be the first one ? because I’m the one first seen by the people whoever come to your room.” I felt great and bliss to start a painting on my door. 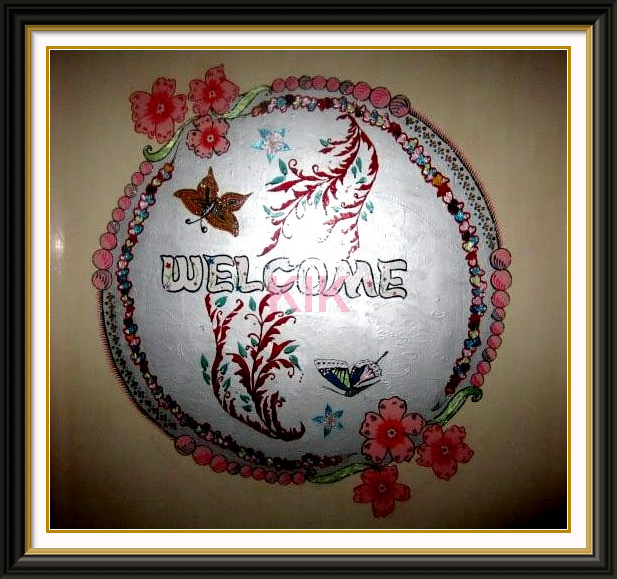 Finally I took few weeks to finish my paintings on my door. I’m happy that who ever comes to my room appreciated me for what I have done on my door, then my vacation ends, my college starts , years passed. One day I felt I should do something more better than previous to my door and decided to erase the painting which I already done and filled my door with new paintings in the year, 2011. Finally one of the paintings on my door……….